As a travel writer, sometimes I discover an experience that makes me hoot with surprise. 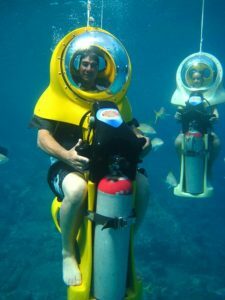 This was my reaction to Aqua Adventures in St. Thomas, which has these underwater scooters where you can scuba dive without any training or experience. You don’t even need to move your arms and legs, as you are literally driving a tiny submersible vehicle! 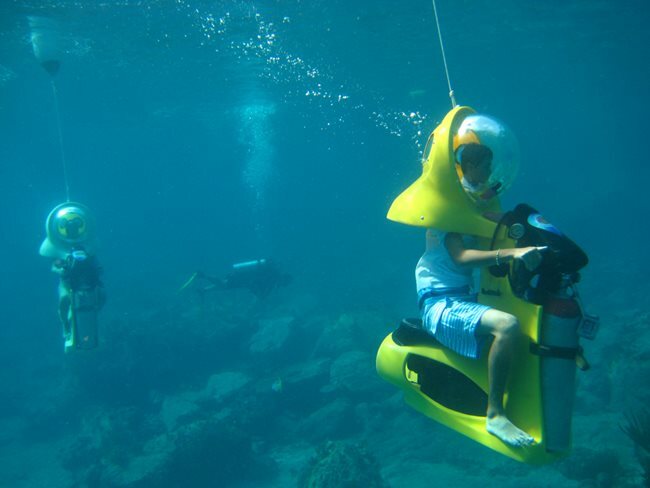 They call them B.O.S.S., or Breathing Observation Submersible Scooter. 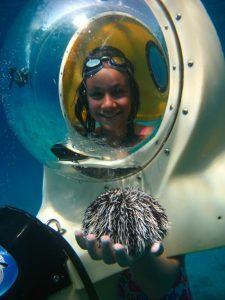 Unlike most of our US Virgin Islands vacation, where we avoided the city of Charlotte Amalie and the crush of cruise ship tourists, Aqua Adventures is based right downtown, near the St. Thomas Skyride and where cruise ships docks. You board a large tour boat, and then go out a 30-minute ride to an ocean spot with good underwater views, just offshore another island. There being only so many scooters, tourists take turns. Every 25 minutes, another group went out with the scooters while the others could stay on the boat or go snorkeling. Everyone wears a flat but easily inflated life vest, and you wear a helmet (which is attached to the scooter) that encloses your entire head and is fed air from a tank on the back of the scooter. Most of us climbed into the water, swam out to our scooter, stuck our head into the helmet, and went. There were two people who were not comfortable swimming, so the crew used a chain hoist to lift their scooters up, so that the tourists could board from the ship’s ladder instead of from the water. Surprisingly it didn’t take long to board and go. 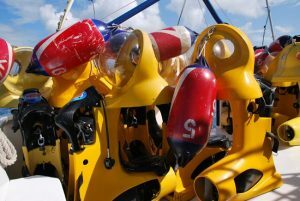 The whole time, you are only 8 feet below the water, with your submersible attached to an inflatable buoy at the surface. Pro tip: ask to get one of the faster scooters, so that you aren’t left behind. Scuba divers follow you to help you along and take photos for you. One even rescued my camera for me when I dropped it! There was plenty to see in the water! Although we didn’t see large sea creatures, we saw many kinds of small and medium-sized fish. One of the scuba guides had fish food, causing fish to flock all around. We also saw a shipwrecked boat. Because there are no reference objects in the water, the sea floor, which was 40 feet below the surface and thus far, far below us, looked like it was just barely skimming by under our feet! It would have been nice to know in advance how close the sea floor would look, so that we didn’t panic. My guest and I, independently really thought that we were going to hit something on the sea floor. As a very tall and obese man, I found the scooter to be a bit confining and claustrophobic, but I calmed myself and had a lot of fun. My guest felt at times like she was tilting and had to lean back against that feeling. We did receive instruction, as one giant group, how to use the scooters, but having instruction in smaller groups would have taken the same amount of time (for the tourists) and allowed more comfort asking questions and actually touching one of the scooters before boarding. There were only 31 people on the boat, so there was plenty of seating room, including room in the shade and room below decks. We met a lot of nice people aged 20 to 60. They didn’t have any college kids who were just here to shout and play loud music. Actually, they didn’t play music in the boat at all, which we appreciated. It allowed us just to enjoy the beauty of nature, without being inwards focused, like we had to party to have fun. We saw only a couple of well-behaved children. It felt classy to us, not cheap or crass in the way that some tourist outings can be, especially those associated with a cruise ship. So, actually, it was great time on the boat as well as on the scooters. It was a mellow, comfortable day with a good little community. It was led by the captain, who was always making jokes, and the crew, who were very helpful and supportive. They didn’t make us feel like we had to be macho, and they had good energy, if you know what I mean. Some tour companies, well, the staff are doing the same thing every day. It becomes boring. So we appreciated that at Aqua Adventures they kept up their energy to match ours, because to us it was unique and exciting. The crew even walked around the boat, speaking with people and getting to know them. They gave each group some individual attention, and answered our questions. The tour offered only ordinary cookies, Capri Sun drinks, and water. They sold underwater cameras on board. The views were spectacular going to and from the dive location, which featured a natural line of rocks protecting us from any rough ocean waves. Thus the water was very smooth and easy to enter. 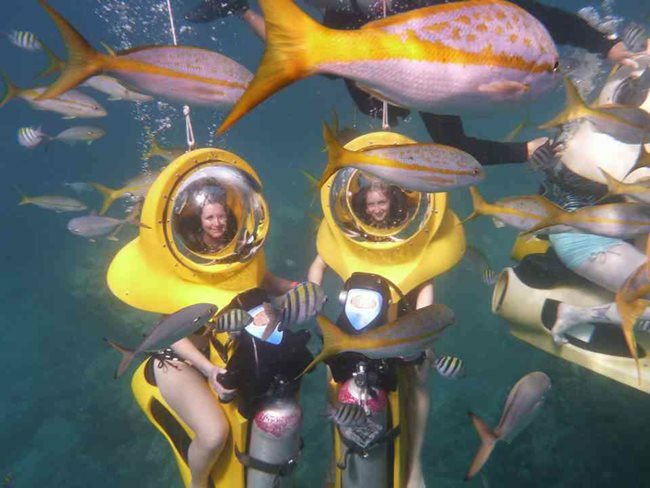 Having an hour for tourists to snorkel while waiting for people to do the boss submersibles was plenty of time and it didn’t seem like anyone on the ship felt like they needed more snorkeling time. The entire tour takes 3.5 hours.